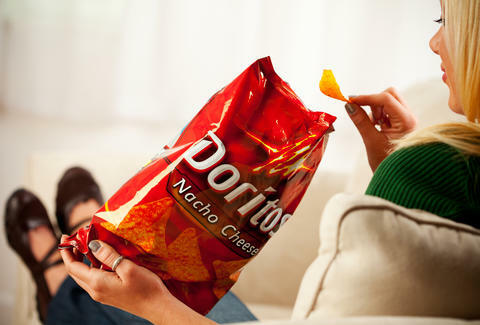 There's really no "polite" way to house a bag of Doritos. They're crunchy, they shatter into crumbs when you bite them, and they leave your fingertips coated in a delicious layer of Cool Ranch dust. Then again, that's part of the appeal of stuffing your face with flavor-packed corn chips, isn't it? But what about the women who love Doritos? Shouldn't they have the option to enjoy them demurely, like a feminine lady is expected? Surely, they shouldn't be chomping corn chips as loudly as men in public. Or licking their fingers when finished. Oh, and shouldn't the bag be, like, pink, and small enough to fit in their handbag!?! That's evidently what the bosses at Doritos concluded, because the brand was reportedly experimenting with a "lady-friendly" version of their signature chip, designed to be quieter to eat, less messy, and packaged to fit primly in a purse. In a recent interview on the Freakonomics Radio show, PepsiCo CEO Indra Nooyi explained that women don't like to eat Doritos like men do. "When you eat out of a flex bag -- one of our single-serve bags -- especially as you watch a lot of the young guys eat the chips, they love their Doritos, and they lick their fingers with great glee, and when they reach the bottom of the bag they pour the little broken pieces into their mouth, because they don’t want to lose that taste of the flavor, and the broken chips in the bottom," she said. "Women would love to do the same, but they don’t. They don’t like to crunch too loudly in public. And they don’t lick their fingers generously and they don’t like to pour the little broken pieces and the flavor into their mouth." It's evidently a big enough issue that it warranted finding a way to re-engineer the classic Dorito to make it more suitable for women to enjoy. According to Nooyi, lady-friendly chips would be just as flavorful, but "low-crunch" and not as messy on your fingers. Oh, and they'd be sized to fit a purse "because women love to carry a snack in their purse," she said. If this all feels a bit absurd and sexist to you, you're not alone. In fact, the backlash following initial reports about the Nooyi's comments has been swift, and people are flocking to social media, roundly criticizing the tired gender stereotyping. So, to all girls growing up into women: to hell with them. Crunch your chips, lick the sauce off your fingers, chomp your food, take delight in what you eat. They made up the rules for you as they went anyway, you can do the same. But the Doritos thing isn't real, right? Like it cannot possibly be real. UPDATE, 2/6/2018, 9:57am: On Monday night, a spokeswoman for PepsiCo responded to the brouhaha, claiming the company isn't actually working on the so-called "Lady Doritos." "The reporting on a specific Doritos product for female consumers is inaccurate," she stated in an email to AdWeek. "We already have Doritos for women–they're called Doritos, and they're enjoyed by millions of people every day. At the same time, we know needs and preferences continue to evolve and we're always looking for new ways to engage and delight our consumers." Either way, a low-crunch version wouldn't be such a terrible idea. However, rather than try marketing them to women, they should just try appealing to all the misophoniacs out there.